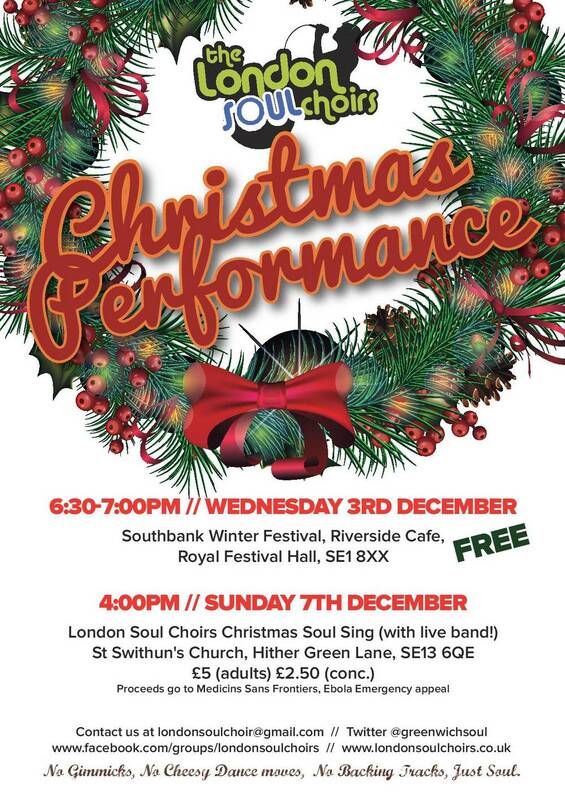 Hither Green & Greenwich Soul Choirs get together to perform this Christmas! The Hither Green and Greenwich Soul Choirs will be singing together for two spectacular performances this Christmas! Together they will be a 60 strong wall of Christmasy sound! Join a Pop-Up Jazz/ Gospel Choir for the Hither Green Festival! NEW for the Festival: Join the Wash Away My Tears Pop-Up Community Choir! A short course of choir rehearsals finishing in a performance for the Hither Green Festival. The Choir is open to everyone, no auditions or sight reading necessary! Location: St Swithun’s Church, 191 Hither Green Lane SE13 6LE. The Big Concert & Performance : 7pm, Wednesday 21 May at St Swithun’s Church. Family Rate : £20.00 parent/s – carers +more than 1 primary aged. Come and enjoy this performance by Lee Green Community Choir at the Church of the God Shepherd, Handen Road on Friday 21 March from 8.15 pm. Entrance £2.00. Free refreshments. One for the diary! Book now as these events will sell out FAST! The Sing in Back Choir at the magnificent St Mary’s Church. A major music and arts festival will take place from 12th-19th October 2013- at the magnificent St.Mary’s Church in Lewisham ( next to the hospital). Many local choirs of note will be performing for your delight over the week- totalling hundreds of Lewisham singers! The Raise the Roof Choir. Check LewishamParishFest for the full timetable & to buy tickets.